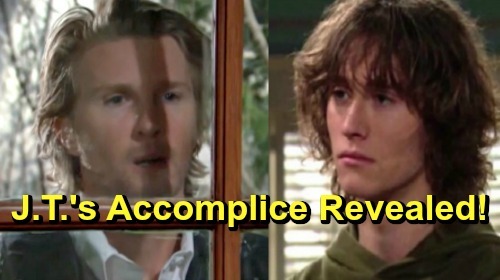 The Young and the Restless Spoilers: Is Reed J.T.’s Secret Accomplice – Son Given Means, Motive & Opportunity To Seek Revenge? The Young and the Restless (Y&R) spoilers recall that the CBS soap intentionally announced that J.T. Hellstrom (Thad Luckinbill) is alive. More than a teaser, this apparent reality also begs a reasonable question. Has Reed (Tristan Lake Leabu) been his accomplice? Y&R history proves that the angry young man has means, motive and opportunity to join his dad in seeking revenge. It’s not that Reed would have been helping his dad from the beginning, meaning April 13, 2018, the date the Coverup Crew and the audience assumed J.T. was dead. No, Reed’s reactions weren’t faked when he was last seen in Genoa City. When Phyllis (Gina Tognoni) cruelly chose to expose J.T.’s abusive behavior at his own memorial Y&R fans will recall that Reed completely lost it. Assuming Reed helping his dad proves to be true, news of his father’s seeming death would have been followed by a connection between the Hellstrom men at a more recent point in time. The Young and the Restless spoilers state that Reed would have felt betrayed by his grandmother (Nikki, Melody Thomas Scott) and mother (Vickie, Amelia Heinle). That, along with an assumption that his grandfather, Victor (Eric Braeden), wouldn’t be an ally, would have driven Leabu’s character over the edge, to his father’s vengeful frame of reference point. So why did Y&R write Reed back into the story only to remove him? He was said to have returned to school, but he’s rarely been mentioned as the most dramatic elements of this eleven-plus month storyline excels toward its climax. That’s odd and could be a plot hole, or a clue. J.T. surely could be operating alone. But wouldn’t the mind twist that Y&R forced into this character lend itself to incorporating Reed as a trusted accomplice as well? Yes, that would make sense. Especially since J.T. would not have shared his plans to do physical harm to the cover-up crew. Clearly, if all is as it seems to be, J.T. will meet a legitimate end point soon. If he’s not forever written off the earth, for real, then he’s certain to be put in prison, or confined (for awhile) to a secured mental health facility. So, wouldn’t that preclude Reed from being tied into this type of plot since he would also face legal repercussions? Maybe, but because he’s young, impressionable, and could be seen by Paul (Doug Davidson), and Christine (Lauralee Bell) as having been coerced by his dad, a different type of outcome could be applied.